Dumbbells are a handy and versatile tool that you can use in a variety of different ways to achieve a variety of different goals. If you’re into bodybuilding and are lifting weights primarily for the purpose of increasing muscle mass, then they are an invaluable tool. Barbells are great and should be used in your training, regardless of your training motivations, but they don’t have quite the same versatility of dumbbells, especially when it comes to isolation exercises and isolating one arm over the other in particular. When it comes to kitting out your home gym, there are a few pieces of equipment that are vital. 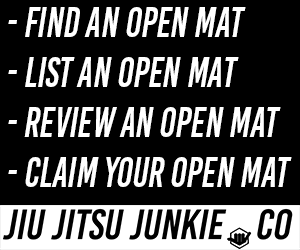 Mainly a good, solid barbell, a bench, maybe a power rack for squats, maybe a couple of kettlebells. These are all things that are fairly ubiquitous in home gyms. Something that you might not often see is someone with a full and complete rack of dumbbells. Getting yourself a full rack of dumbbells is expensive. They also take up a lot more space than say, a barbell and a collection of weight plates. With these things considered, it’s somewhat difficult to find a good set of dumbbells at a good price with a decent selection of weights. Your best alternative to splashing out on a large, space-consuming set of weights is to buy adjustable dumbbells. These are dumbbells that can have pieces of them added or removed in order to increase or decrease the weight. When not in use, they only take up the space that a single, large pair of dumbbells would. You then strip the weight pieces off to get to your ideal weight. You get a larger variety of different weights that you can use but a tiny fraction of the cost it would be for a full rack. Each dumbbell can transition from 5 pounds of weight all the way up to 52.5 pounds. You have the option of 15 different weight options in one; increasing 2.5 pound increments up to the first 25 pounds, where they switch to slightly larger increments that you would also expect with traditional dumbbells. This means that one pair of Bowflex SelectTech 552 dumbbells replace 30 individual dumbbells! The parts connect and disconnect quickly and effortlessly so you can switch weights without eating into your valuable rest time between sets and different exercises. Bowflex also provide a handy tray to place the dumbbells when they’re not in use so that they don’t roll away and cause an accident. They can also be purchased as individual dumbbells rather than as a complete set. NordicTrack have created an especially stylish and almost futuristic set of dumbbells with this Speed Weights product. The smooth black look with electric blue accents make it so that these dumbbells wouldn’t look out of place in a gym on a space station in the future. Starting at a low of 10 pounds and going all the way up 55 pounds per dumbbell, this single pair of dumbbells can provide a complete workout all by themselves by switching weights quickly and easily without fuss. NordicTrack also provide a pair of storage trays so you can store the bells away safely. The trays also show you how much weight each bell weighs at any time via a handy graphic on the top of it. Now these are the original adjustable dumbbell set. Commonly seen in smaller gyms, like you would find in a hotel, these became insanely popular as they solved the aforementioned space and price problem that often arises when purchasing dumbbells. They have an almost retro aesthetic style to them, with different colours specifying how much the bell weighs. The extra weight parts peel off in a way that allows the dumbbell to retain it’s structural integrity and be evenly distributed in weight. Some of the cheaper, copycat models that tried emulating PowerBlock were often weighted more to one side which rendered them pretty much useless and outright dangerous. They also feature a rubberised handle that gives you unparalleled grip when doing presses, curls and flyes, etc. One of the downsides to adjustable dumbbells is that they often aren’t that heavy at their maximum. It’s understandable that they can only tack on so much weight without becoming overly bulky but it can be frustrating if you’re a stronger trainee who needs that extra challenge. Merax have solved this problem by creating a set of dumbbells that go all the way up to 71.5 pounds, increasing in 5.5 pound increments from only 11 pounds. Other adjustable dumbbells that offer heavy weights often end up starting at heavier weights also, so it’s nice that Merax give you the option of light and heavy dumbbells, and everything in between. The dumbbells come with handy storage trays but can also be purchased with an optional stand that place the bells at around waist height so you can lift them without injuring your back. The stand can also be purchased at a later date if you decide afterwards that you think it would be beneficial. These dumbbells from Bayou Fitness look and feel the most like traditional dumbbells out of the ones on our list. Adjustable dumbbells can sometimes require a little bit of getting used to if you’re used to your typical bells but it’s not the case with these. If you’re particular concerned that you might not be able to get to grips properly with adjustable bells, then stick with Bayou Fitness. These dumbbells, and the accompanying weight plates, are low-profile and compact and can be adjusted from 5 pounds up to 25 pounds, or even higher if you decide to purchase the 50 pound set. Bayou Fitness also allow you to buy the 50 pound dumbbells individually if you decide for whatever reason that you only need the one. These are a great cost-effective set of dumbbells for the newbie trainer who wishes to try creating their own home gym. 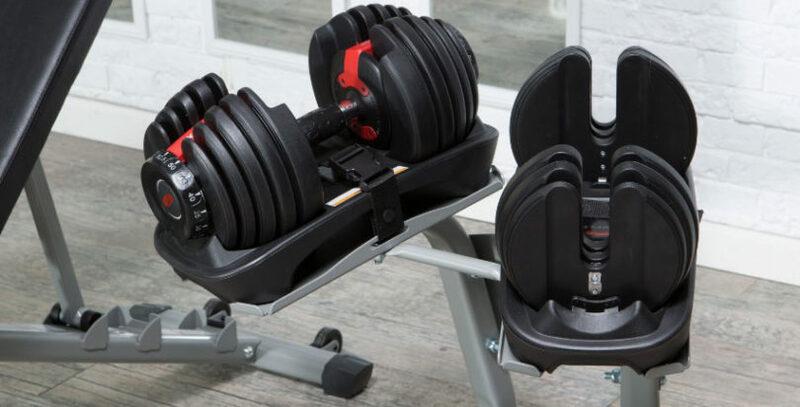 Adjustable dumbbells are a great alternative when you want to completely kit out own home gym but find that your available space and wallet don’t readily agree with your desires. These dumbbells operate exactly like normal dumbbells do and will give you the exact same workout you’d expect from a traditional set. With a pair of these, there’s no longer spending ages searching around the floor looking for that elusive matching dumbbell.